However enjoyable, Christmas can be a very stressful time. The number of things to prepare, plan for and organize is not a small one. If you're afraid that you'll forget your In-Law's present or that you'll end up with no hard candy for your nieces or that not a branch of mistletoe will turn up in your home - you may want to calm your nerves with getting properly organized. With Kanban Tool you can simply make a board for this coming week and get cracking! It will be even more fun of you get your family involved - you can delegate Christmas duties to each family member and that way you'll have less on your plate and everyone can feel christmasly involved!! Spread your Christmas jobs along the week so that you don't get bombarded with things to do on Christmas Eve, and enjoy pulling one task at a time into the Doing column - and than sliding it to Done! Make sure that this year's Christmas preparations don't get the better of you! 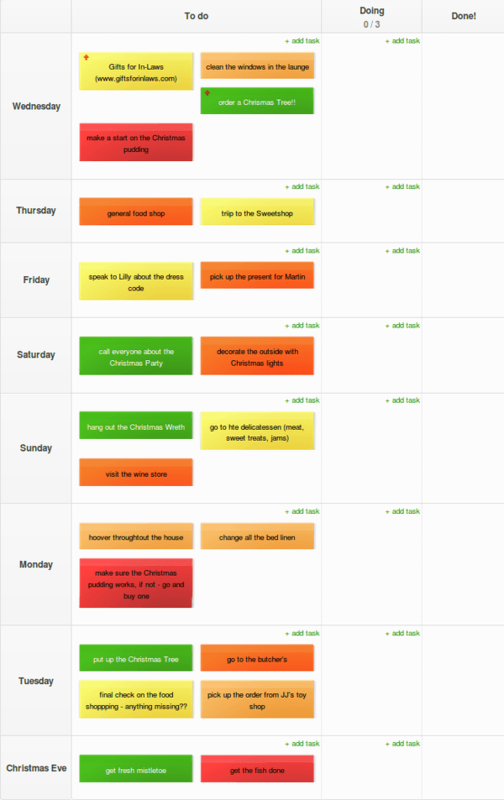 Christmas preparations can be hard, but with Kanban Tool they can also be fun! !